How To Make Blog for beginner 2018 - Because of many request from readers who ask how to make blog, so I am very glad and very spirit to write an article in Aplimuvie. Don't forget to reader for giving comment, like, share and subscribe my blog, don't be bored. Ok...! . Blog is website to them who like writing an article and whatever their hobby it will be accommodated in blog, blog is very good for them who likes sharing experience and hobby. 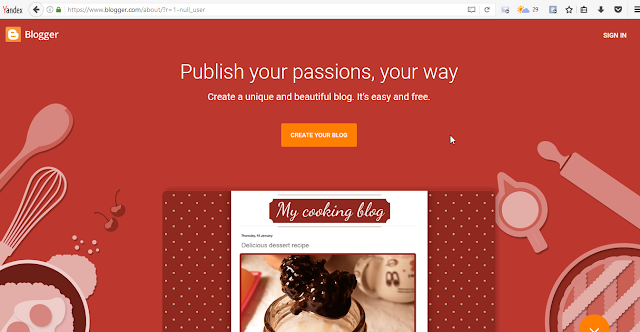 Many kinds of blog but here I will share about google product that is blogspot/blogger. The benefit from blog is so many, can be a hobby, can be a good and flexible job because google will pay us everytime our blog visited by someone, but there is requirement. If you just writing an article on blog without knowing how to get sakary from google so you only share your experience or your opinion but if you know you will get it. You only need to connect it to google adsense so you will get skaary million until hundred million. 3. Then press lanjutkan ke blogger. 5. Decide judul (title) and Alamat (Address) . If you have finished please click buat blog. 1. Judul is a title which can be address of your website later. 2. Alamat is address your sebsite later after you finish making account. Example Operatorsmkbawean.blogspot.com if no one uses it so it will be blue checklist and if someone uses it so it will be yellow symbol caution. Please you decide by your selves name of your blog, and you are free deciding title what you want. After that you choose buat blog. There are many theme which you wnat. You only need to take one of theme be yours. That's all my writing, may you can practice it well, for the next article about blog will I share next. Wait for it. Ok....! see you...!! !